One thing we love to do here at Western Neighborhoods Project is connect people with places. When we saw this lonely mansion in the OpenSFHistory collection, we wanted to know more about it, and boy-oh-boy did we find an intriguing story. The house at 1490 Hayes Street was built by Franklin B. Heywood – a successful man whose complicated family life ended in scandal. Constructed in 1888, the home was designed by a prominent turn-of-the-century architect named Charles I. Havens. 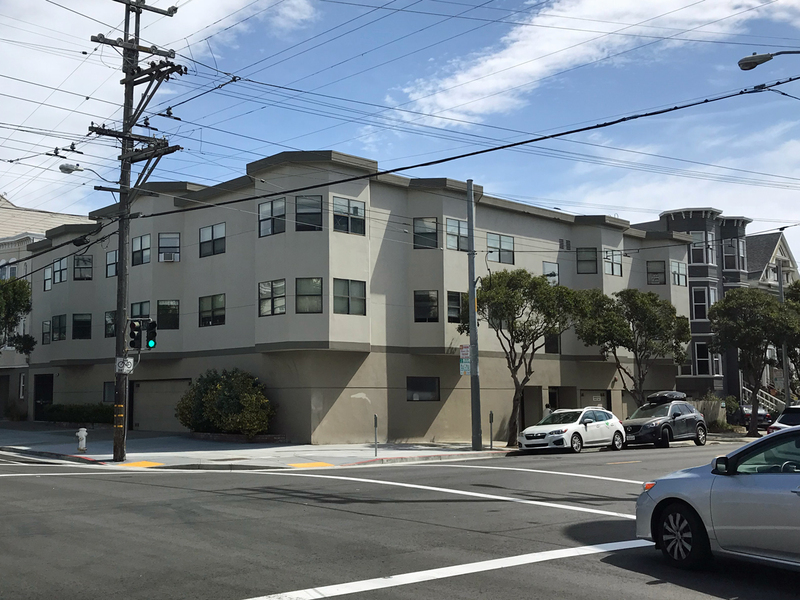 He would later be San Francisco’s City Architect for twelve years, designing many of the city’s early schools (none of which survive) in addition to other private residences and commercial structures. Many of his buildings still exist but, sadly, 1490 Hayes is not one of them. By 1986, this beautiful Havens original had been demolished and a large apartment complex built in its place, reoriented, and newly-designated as 400 Baker Street. Franklin Heywood was the son of Zimiri Brewer Heywood, who was born in Maine but came to San Francisco with his family sometime in the 1850s. Zimiri founded a successful lumber business with another native of Maine, and continued to expand his business interests over the next two decades–investing in real estate in the East Bay and bringing his sons into the family trade. In 1872, he acquired an interest in a sawmill in Gualala, Mendocino County, and incorporated the venture as the Gualala Mill Company. Franklin, who started working for his father as a clerk around 1860, became president of the company after Zimiri’s death in 1879. Franklin was distraught, telling a friend: “I have been to blame in this matter, and I want to rectify the wrong I have done my wife.” On July 29, 1903, Franklin walked into the bathroom of his lovely home at 1490 Hayes Street, bit down on a rubber tube attached to an open gas jet, and committed suicide by asphyxiation while both Agneses were in Santa Cruz. Rumors connected the suicide to “certain financial transactions,” although those close to the family denied these allegations. Franklin was buried beside Agnes Maud’s hereditary parents, for whom he had purchased cemetery plots after adopting her. Heywood’s will, dated 24 days prior to his death, was filed for probate on August 12, 1903. The whole of his estate, valued near $250,000, was left in trust to his brothers and attorney H. A. Powell, who were instructed to pay lifelong $150 monthly allowances to his estranged wife and adopted daughter. However, many (including his attorney) believed Franklin had drafted another will in the weeks prior to his death. News began to circulate that the women in his life intended to contest the will; a legal battle was brewing. Two months after Franklin’s death, the Gualala Mill Company and its holdings were sold. Agnes Maud petitioned the superior court to hasten the distribution of Franklin’s estate, and claimed her uncles, William and Walter, were neglecting her rights. A tawdry lawsuit airing the family’s dirty laundry dragged on with many excitements–much to the delight of local newspapers–through 1910, and left many questions unresolved. The death and settlement of Franklin Heywood’s estate made for sensational newspaper fodder. The sensational Heywood storyline emerged from two simple images of a stately home, proof that every image holds the story of a San Franciscan. Perhaps, if we look really close, we can see Agnes’s silhouette in the second floor window. That’s probably my imagination running wild, but every time I pass by 400 Baker now I think of Franklin and his Agneses, bringing the Heywoods out of the past and into the present. Which is exactly what we try to do, one image at a time, with the OpenSFHistory project. Mission accomplished. Daniella Thompson, Zimiri Brewer Heywood: Separating Fact from Myth, 2008. “May Contest Heywood Will,” San Francisco Chronicle, August 6, 1903, pg. 7. “Heywood’s Last Hours Fill with Sensational Incidents,” San Francisco Call, August 27, 1903, pg. 3. “Faints While on the Stand,” San Francisco Call, May 4, 1905. 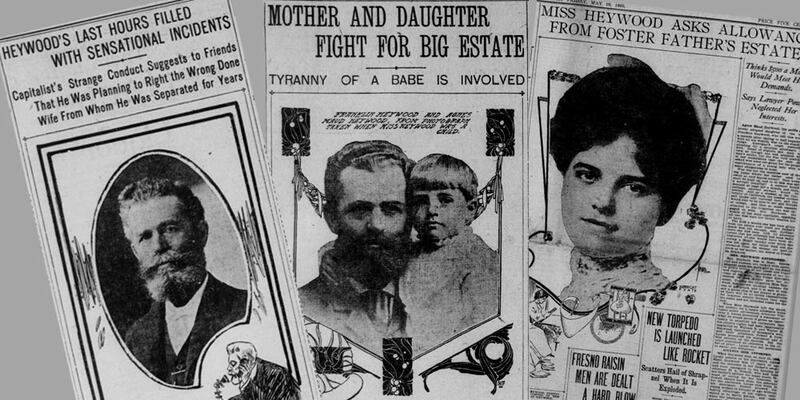 “Heywood’s Executors to Shut Out Daughter,” Oakland Tribune, February 8, 1910.